If you’re new in the makeup community, you’ve probably noticed that applying makeup, especially foundation it’s not that easy as it seems. However, I’m here to help. First, it’s very important to pick the right shade. Second, you have to apply it evenly on the face. Do you prefer liquid or powder foundation? Do you use a brush, sponge or fingers for applying your foundation? What’s the best way to apply it. Keep on reading to find out. What is the foundation and why it’s important to apply it properly? What types of foundation exist and what to use for application? Foundation represents a skin-colored makeup product that will help you cover the flaws while giving you that smooth and velvety complexion. It will help your skin appear better and clean. There are several types of foundation. However, liquid and powder are two of the most popular. In this article, I will guide you through the full process of application. It’s very important to apply your foundation properly because as the name “foundation” says, it’s the base of your makeup. If you apply too much, you might look fake and clog your pores. However, if you apply too little, you might not cover the imperfections and your makeup won’t last that long. So, what’s the best way to apply foundation and how? Keep reading to learn more about the types of foundation and what to use for applying. I will focus on liquid and powder foundation. And I will teach you how to apply both with a brush because it’s one of my favorite tools for applying liquid and powder foundation. There are different types of foundation for different tastes and needs. For example, you have a liquid foundation. However, applying liquid foundation might get complicated for those who never encountered this product before. Some claim that beauty blenders do miracles when it comes to liquid foundation. Others prefer applying it with a brush. If you want to try out both ways and decide which one suits you best, I have your back. You might as well apply it with fingers, however, I personally don’t recommend it. It will not cover everything. Also, it might leave you with tiny spots or uneven skin complexion. Powder foundation is another type of foundation that’s very popular. It absorbs fast. It doesn’t cause much mess. And it’s lighter on the skin. So, if you’re always in hurry in the morning, this is the foundation for you. However, make sure that you apply it correctly. You will be surprised to learn that the application isn’t the only thing that matters when it comes to foundation. It’s more important is how you prep your face. If you don’t know how to do it, just follow the next steps that I follow every day and you will do just fine. If you have no idea what foundation brush to get, I’ve collected the best foundation brushes for 2019. All you have to do is jump into the list and pick the one that matches your requirements. And don’t worry. You can’t go wrong, no matter which one you pick. If you remember, I have mentioned this type of brush in the step-by-step guide. It’s one of the best brushes for both liquid and powder foundation because it has a flat top head with dense but still soft fibers. They will make sure that you’re applying makeup without putting too much effort. If you worry about brushes eating up your foundation, don’t. This one will provide perfectly blended results without absorbing your product at all. Although it works with liquid, cream and powder foundation, it’s recommended that you use it for cream or liquid products. It blends out very well, especially on the cheeks and forehead, leaving you with a natural-looking skin. Also, it will make sure that you’re not stressing over splotches, lines, and streaks. And the best part is that it comes with a 2-year warranty. In case, it breaks (which never happened to me), you get a new one. If you’re looking for the perfect application tool for a foundation, look no further than the Tarte Cosmetics the buffer Airbrush finish foundation brush. It’s one of the best on the market. And one of my favorite brushes for applying foundation. To be honest, I’ve tried many ways of applying foundation. I have used my fingers (not recommended), beauty sponges, and other foundation brushes. However, this is my favorite because of the affordable price, quality application and booming reviews. It provides medium/full coverage without eating much of your product. It’s perfect for blending out concealer as well. Once you buy it, you will fall in love with it at first application. It provides that smooth, flawless finish that everyone is dreaming of. A soft brush that will never leave marks like other flat brushes. You can also use it with CC and BB creams. Don’t hesitate about buying this one. It will cover your imperfections perfectly, without much effort. Why buy something too expensive not worth the money or something cheap, not very effective, when you can buy the most addictive, most useful, most amazing, most can’t live without makeup brush invented by Jacqueline Kaleb? Instead of wasting your cash on expensive brushes, get the best foundation brush that will make your every makeup dream come true. And when I said “makeup dreams”, I meant, filling up the fine lines, pores, and imperfections. If you never heard of Jacqueline Kaleb, know that she’s one of a best celebrity makeup artist. And who can you trust when it comes to brushes, if not a person who’s involved deep in the makeup industry? With her quality brush, you’ll apply and blend the product in seconds. A luxurious brush that will save you time and money. And the best part is that it has a 1-year warranty. What are you waiting for? If you prefer a beauty sponge over a good old foundation brush, I strongly recommend the Original Makeup sponge that everyone’s using. It’s perfect for foundations, creams, and powders. A recyclable, reusable and washable sponge that will provide a smooth and flawless finish. You can use it damp, as I suggested in the step-by-step guide. However, you can also use it dry, if you want. I suggested that you use it damp because that way, it’s “full” and can’t absorb much of your product. Don’t worry about the shape because it goes back to the original size after it dries. A handcrafted versatile applicator made in the US and will match your requirements. If you take good care of it, it might last 3 months. Also, important information to mention is that this product has been made with safe, water-soluble dyes. So, don’t get too surprised when some of the colors run off and wash away after time. However, don’t worry. They won’t transfer onto your face. Getting back to the brushes, I have one more that will blow your mind. It’s honestly one of the best foundation makeup brushes that you will ever try. A dense but soft, and will apply your foundation perfectly. One more flat top Kabuki brush that I’ve mentioned in the step-by-step guides. A brush that will not meet your needs and expectations. It will exceed them. Your face will look stunning and airbrushed. And you will absolutely adore your new best makeup friend. Made with quality materials, this brush will serve you for a very long time. You can use it every day. Don’t consider it as just one more “Amazon” product because it’s so much more than that. It won’t make your imperfections go away but will perfectly cover them up for the day or night. It works great with every type of foundation. A high-quality, luxurious brush that will provide a flawless, smooth finish. If you’re one of those people who lives for complete coverage, the Matto Powder brush is the perfect choice for you. It features a dense, fluffy and large head that’s ideal for applying and setting your makeup base with large coverage of minerals and powders. It will provide that flawless finish that everyone’s dreaming of. The bristles are soft, which makes this brush suitable for sensitive skin. An anti-bacterial and cruelty-free product that’s easy to clean and maintain. It won’t absorb much of your product. Did I mention that the hairs are hand-cut and have the perfect shape that will provide you a precise and even application? Also, with the Matto brush, you have complete control of applying thanks to the non-slipping handle. Extra joy: It comes with a 1-year warranty. We’re all struggling to reach that corners of our face with our foundation brush that seem untouchable. Well, those days are over thanks to the IT cosmetics heavenly luxe brush. It has a triangle-shaped brush head that will help you cover every spot on your face that seems hard to reach. Have I mentioned that you’re buying an Award-winning brush that will deliver the best-airbrushed results you’ve seen in life? A cruelty-free, pro-hygienic and animal-free brush suitable for every skin type, especially sensitive. If you decide to try it out, expect the best blending results without putting much effort. If you’re looking for a high-quality synthetic brush, I found it for you. It’s the NYX professional makeup total control drop foundation. It’s perfect for liquid foundation because it will smoothly buff out the product onto your face. So, if you’re living for a liquid foundation, you will absolutely adore this brush. It will help you reach all those “untouchable” spots on your face with ease. A high-quality brush that will overtop the expectation of everyone who’s into liquid or cream products. It’s best if you start with the center and work your way out. This simple technique will give you an airbrushed look that will blow your mind. Instead of hesitating, buy this brush now, and thank me later. Another impressive brush on my list of best foundation brushes for 2019 is the IT Cosmetics Heavenly skin CC+ skin perfecting brush. As the name says, it can be used for foundations, skincare powders, and other makeup products. If you’re looking for a brush that’s worth your investment, this is the product for you. Anti-aging and patent-pending brush that will make your skin even more beautiful and will perfectly cover up the flaws. A hand-cut brush head that allows a precise application, while blurring your pores and lines with ease. Made with anti-aging collagen, niacin, silk, and peptides, this is the ideal choice for people who take good care of their skin and makeup look. It suits every skin type, especially sensitive skin. A cruelty-free product that you will adore. Last but not less impressive foundation brush on my list is the Sigma Beauty F60 brush that will blow you away at first application. In fact, it will blow away all your pores and lines, and leave you with the natural, youthful-looking skin that will make you the center of attention. Everyone will stare at your perfect-looking skin and wonder if you’re a real Barbie doll. Made with quality synthetic fibers which are the future of animal hair in the makeup industry, this brush will save you time, money and product. You will apply, blend and seal your makeup look in just seconds. Hypoallergenic, anti-bacterial, cruelty-free and durable, it’s definitely one of the best foundation brushes on the market. Getting your face ready for makeup is an important step into maintaining your makeup longer. Also, it protects your skin. Still, just like many, I have to admit that when I am tired, I skip this and apply my foundation directly, thinking that my skin can pull it off. I immediately regret doing it. If you have dry or combination skin, you know why. If you don’t clean and moisturize your face, the dry skin will not soak the foundation properly. That’s why I recommend that you don’t let your laziness ruin your entire look and follow these steps on how to prep your face for foundation, so it looks better and lasts longer. First and foremost, you have to clean your face before you apply foundation or any type of makeup. Otherwise, it might irritate your skin and clog your pores. Also, why not feel fresh and applying makeup on a clean face if it takes a minute to wash it? I recommend that you wash your face before you go to bed, so you don’t have to remove your makeup in the morning. However, you’re free to do as you wish. Just take a cotton pad soaked in cleansing water and remove the makeup, grime or oil. After, it’s time for a moisturizer. If you’re not the biggest fan of moisturizer, know that your foundation is. If you skip this step, your foundation won’t soak into your skin. And not just that but it will appear dry and flaky. If you’re a fan of full coverage heavy foundations, applying a moisturizer will help you look more soft and natural. Massage the moisturizer into your skin but not onto the eyelids. Let it sink for about 10 minutes before you start applying foundation. If you’ve picked the right shade and type of foundation, it’s time you apply it. If you’re new to this and you want to learn how to apply both liquid and powder foundation with a brush step-by-step, keep on reading. If you haven’t picked the right foundation shade, I have an extra tip for you. Instead of buying something that’s too dark or too light, try it out on your cheekbone. If you’re applying the right shade, it should fade into your skin. On the contrary, you’re using the wrong shade. Also, decide between light, medium and full coverage before you buy your foundation. Also, choose the right application tool (brush/sponge) and you’re good to go. If the liquid foundation is your cup of tea (mine too), this step-by-step guide will teach you how to apply it perfectly. It’s simple but effective and based on my long experience with liquid foundations and different application tools. Now, let’s jump into the process. If you decide to apply liquid foundation with a tapered brush, use short, outward and downward strokes. Start from the center of your face and move outwards. And make sure that you blend down to the top of your neck to avoid a line and apply it evenly on the face and neck. And if you notice any lines, just use your brush to blend it all out. If you decide to apply liquid foundation with a stippling brush, keep in mind that it will provide sheerer coverage, unlike the foundation brushes which offer medium coverage or full coverage. Use a stippling move to apply and press the product on your face for a light and natural finish. Use gentle moves all over your face to get that smooth finish. If you use a rounded foundation brush for applying your foundation, it’s suggested that you use stroking and swirling movements. Also, use circular movements to blend out the product. This will prevent any lines or creases and will help you get that natural finish. If applying your foundation with a flat-top kabuki brush, make sure that you cover the area that are harder to reach and require more coverage. Use this brush to press the foundation into your skin, while blending it out at the same time. Use lighter sweeping or swirling movements to finish with the blending and get that flawless, smooth finish. Just in case you decide to use a beauty sponge or fingers for applying foundation, I’ve written a few tips on how to do it right. If you use a beauty sponge, expect that natural smooth finish that everyone dreams of. First, you should wet your sponge. Squeeze out the extra water and use gentle pressure to the damp sponge and press the product into your skin. Use tapping movements to blend out the foundation and get that smooth look. If you decide to use your fingers, make sure that you wash your hands before you start applying. Some makeup professionals say that fingers give the best results, but I don’t share their opinion. If you want to try out this method, feel free to do it and warm up the foundation between your fingers. Apply and blend it out using circular movements. If you prefer pressed powder foundation over liquid foundation, this is the only guide you need to learn how to apply it right. Follow my simple steps and you will do just fine. A rounded kabuki brush is perfect for achieving that flawless finish. However, keep in mind that you get sheerer coverage. Use circular movements to apply and blend it out. If you’re using a rounded foundation brush for applying foundation, use quick, back-and-forth motions to apply and blend it out evenly. In the end, press the product using light pressure all over your face. It will give you that smooth finish that you were aiming for. If you’ve been using a pressed powder foundation for a long time, you probably noticed that most of them come with their own puff. And if you decide to use this puff over a brush, it’s totally fine. This application tool is perfect for patting the product over the oily parts of your skin (if you have oily/combination skin) and cover them up completely. I would never recommend that you use fingers for pressed powder foundation because you won’t get the wanted results. However, using a beauty sponge can get the job done if you use it right. Just wet your beauty sponge, squeeze out all the water and apply it in dabbing motion. In my opinion, it’s best if you use a foundation brush. Still, it should be your choice because it’s your face and money after all. Also, brushes have their own cons. Keep on reading to find out the pros and cons of applying foundation with a brush. 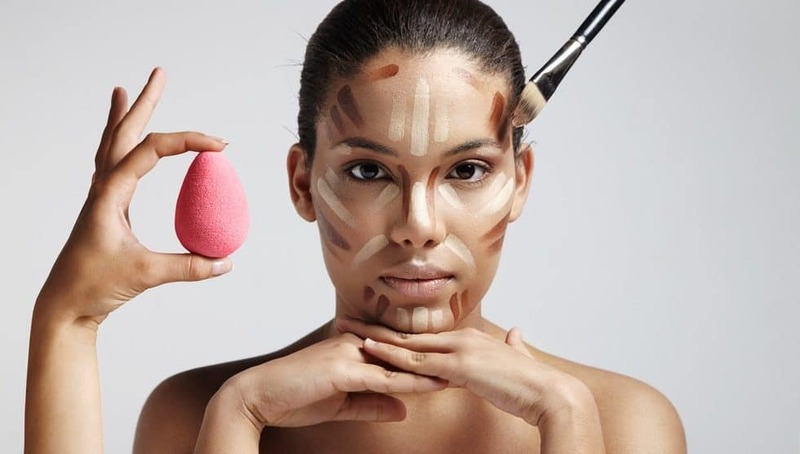 Just like any other makeup tool, applying foundation with a brush has its pros and cons. For example, if you’re using liquid or cream foundation, natural hair bristles won’t work. I sincerely hope that you found this article interesting and helpful. And if you did, don’t forget to share it with someone you love who may find it interesting and useful as well.